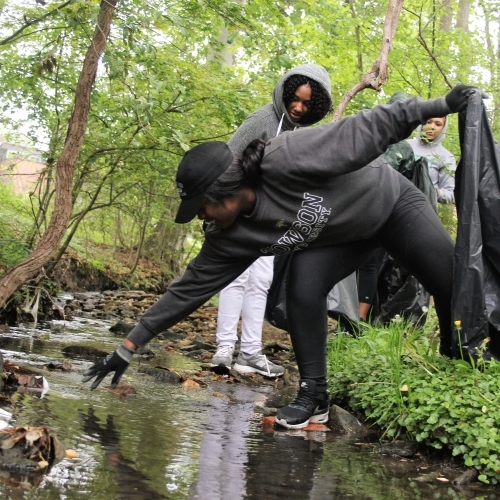 Raindrops trickle through the tree canopy as Towson University’s Black Student Union cleans up the woods behind Brown Memorial Weekday School. One by one, BSU Vice President Aaliyah Perez reaches out her hand to help her friends across the stream and soon, the club is doing their part in The Big Event. 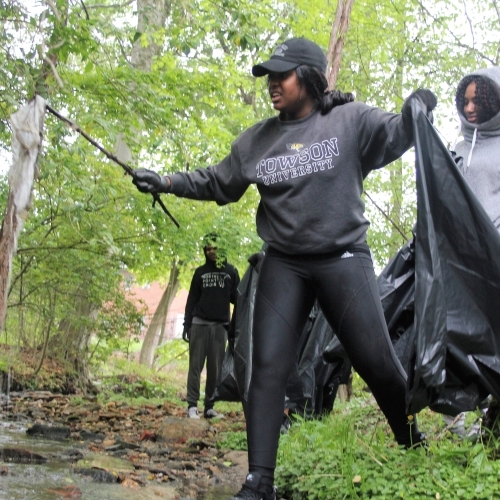 According to student coordinators for the eighth annual The Big Event, 1,800 students registered to volunteer to help clean up the greater Towson community. That’s around 700 fewer than last year’s registration count. 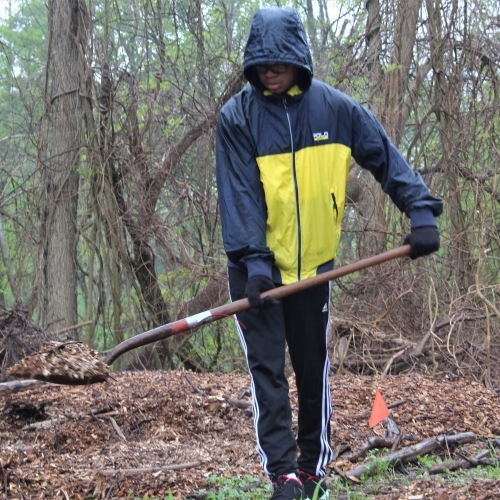 A Towson student clears overgrown brush at Lake Roland. A BSU member shovels mulch to form a pathway. 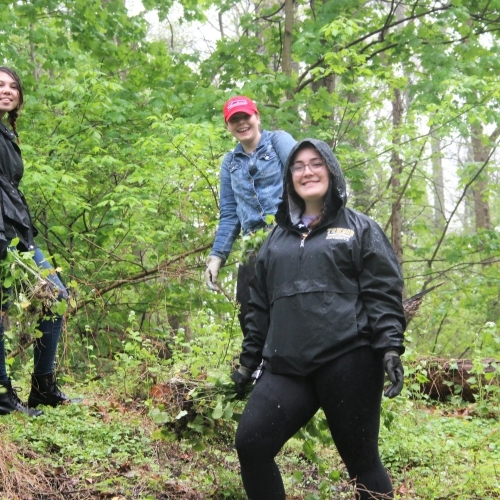 Three members of the Tiger Lillies, a community service club for Towson women, clear overgrown brush alongside the road to Lake Roland. 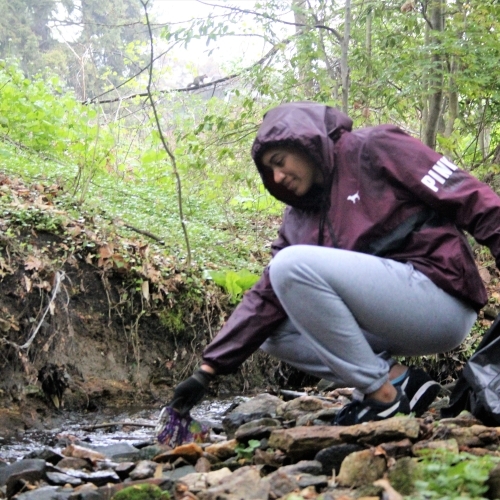 A BSU member picks trash out of the stream behind Brown Memorial Weekday School. 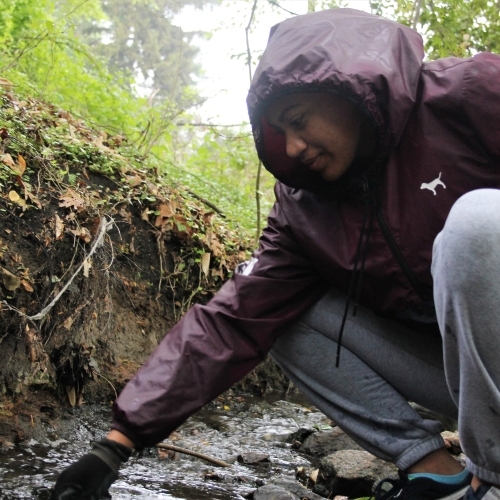 BSU Vice President Aaliyah Perez prepares to fish a piece of plastic out of the water. BSU Vice President Aaliyah Perez fishes a piece of plastic out of the water. 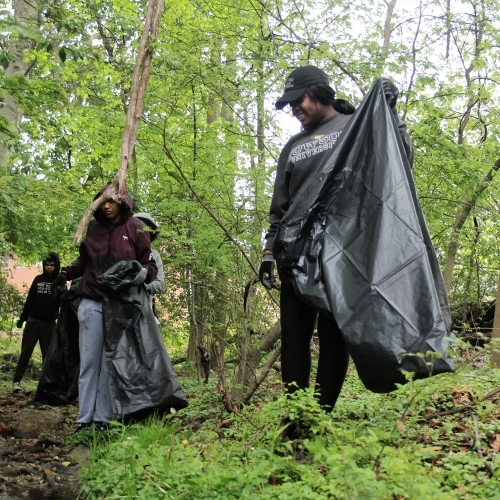 BSU members prepare to clean up the woods behind Brown Memorial Weekday School. 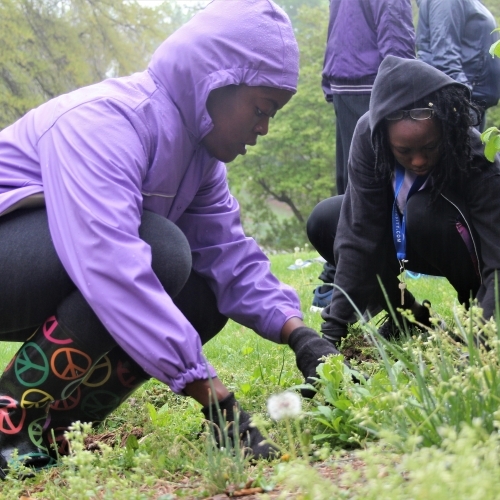 A BSU member pulls weeds. 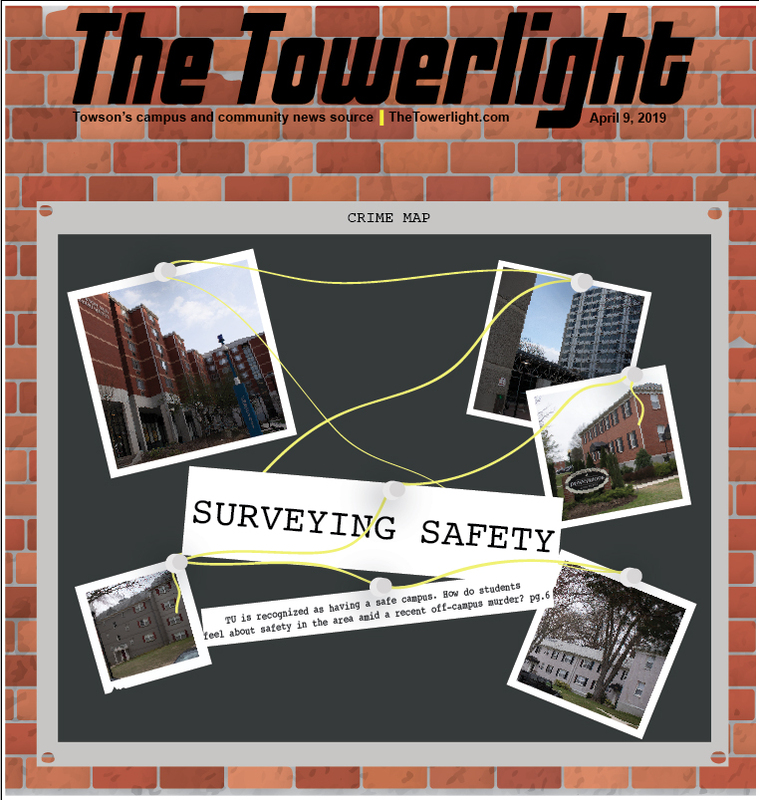 All photos by Marcus Dieterle/The Towerlight. 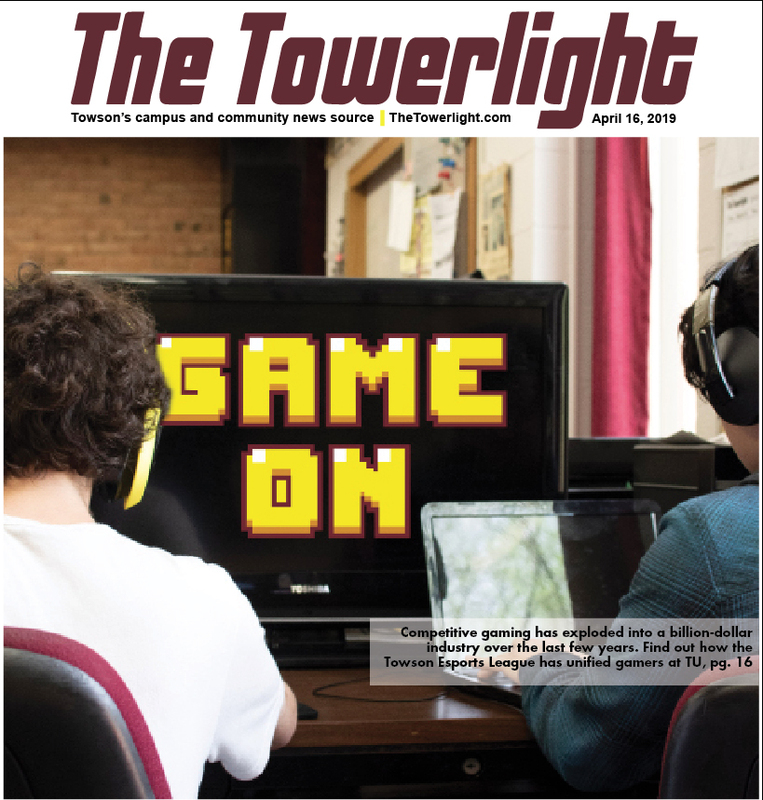 In 2016, over 2,500 students, faculty and alumni registered, but only about 1,900 actually participated, according to previous reporting by The Towerlight. Student organizer Madelynn Steinbiss attributed this year’s registration decline to the new $25 no-show fee instituted this year. She said that the lower number meant that event coordinators had to renege on some promised project sites and reconfigure groups to meet the community’s needs. 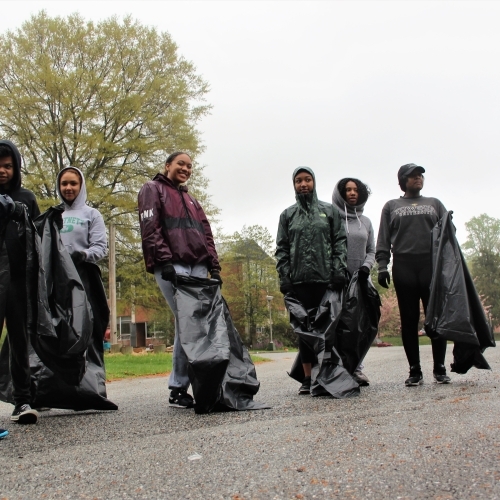 But these setbacks, and cloudy, gloomy weather, couldn’t stop a small army of Towson students from giving back to the surrounding community. 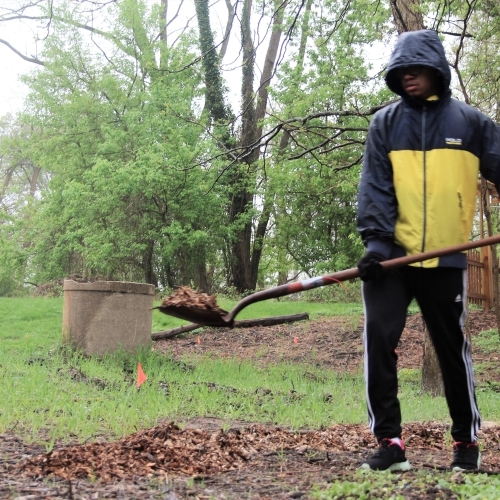 Perez, whose attendance marked her third year participating in The Big Event, worked with other members of her organization to haul mulch, remove rotting tree stumps and clean up trash in the woods behind Brown Memorial Weekday School, about a mile and a half from campus. 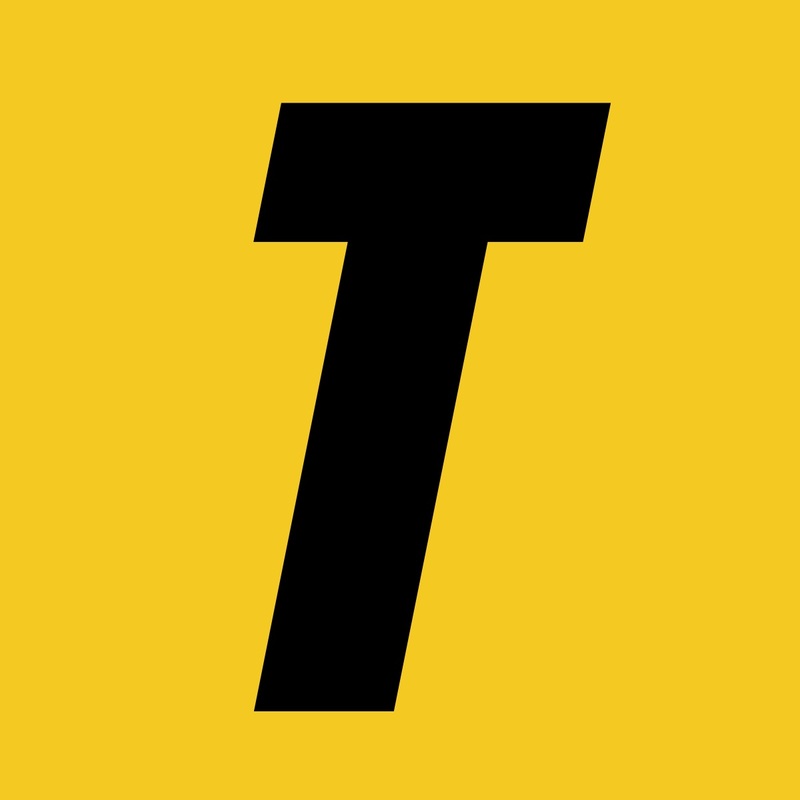 According to Steinbiss, volunteers served 160 project sites by picking up debris and assisting homeowners, businesses and nonprofits with tasks they needed completed. She said 20 staff and faculty, and 20 alumni, volunteered for the event. 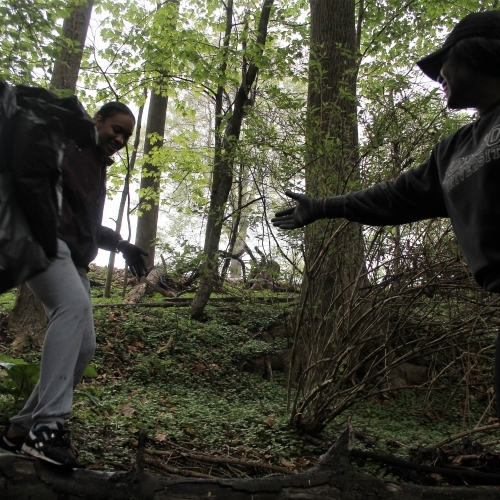 Sophomore BSU member Russhell Ford emphasized that it is everyone’s duty to protect the environment. “I just think it’s important to — because we’re doing environmental work — just to always remember that the environment is important to take care of just as a whole and that cleaning up is all of our responsibilities,” Ford said. Alice Wetzel, a teacher at Brown Memorial Weekday School, worked alongside the BSU to create mulch pathways for the school’s students to walk along. Wetzel, who helps with the school’s nature coordinating, explained that the school has Forest Fridays, when teachers bring their students into the woods, where they can explore things they wouldn’t normally see in their own backyards. 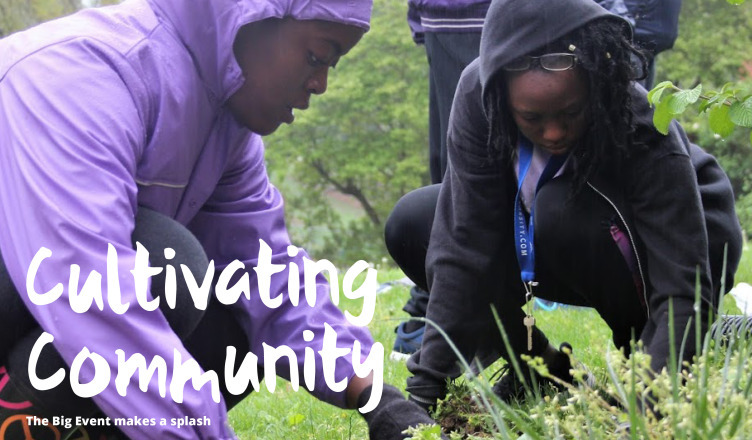 The Students Achieve Goals through Education (SAGE) residential learning community of Newell Hall removed weeds and added greenery at Towson High School. Senior Khera Colbert has participated in The Big Event for four years. “Being an RA on the SAGE floor with mostly freshmen, I wanted to show them that giving back to the community is important by getting a bunch of them to come and do The Big Event with me,” Colbert said. 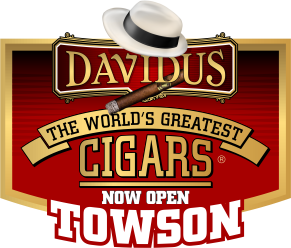 Sophomore Christine Paje said that The Big Event provides a good opportunity to get involved in Towson’s surrounding communities. Her club, the Filipino Cultural Association at TU (FCAT) helped at homeowner Rose Fleming’s home by clearing her patio and pulling weeds. 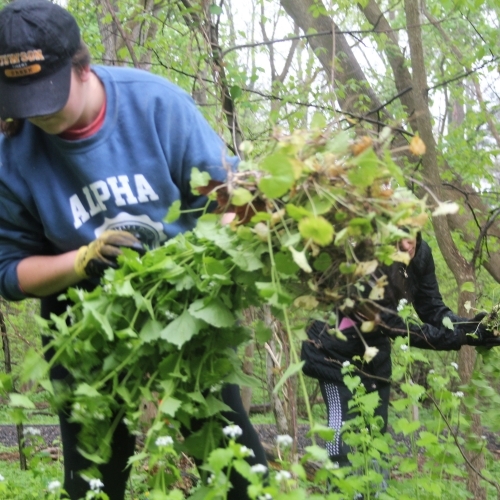 At Lake Roland Park, the Alpha Gamma Delta sorority and Tiger Lillies, a community service club for Towson University women, helped clear overgrown brush. AGD sister and sophomore Olivia Chapman said that events like The Big Event can help to give Towson’s Greek Life a better reputation. Conrad Provan, a senior biology major and naturalist at the Lake Roland Nature and Environmental Education Center, said he hopes that The Big Event makes students more aware of the community beyond campus. Director of Civic Engagement and Leadership Chris Jensen said he believes students participate in The Big Event because of their altruistic nature. 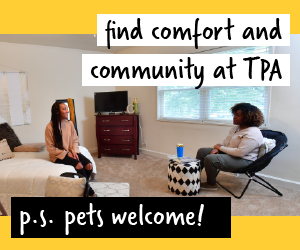 “They’re part of Towson, they see Towson as their home … and so I think they want to be a part of it,” Jensen said. Jensen said The Big Event’s yearly success is due in part to the fact that student groups and Greek Life organizations earn community service hours and Chapter Achievement Points (CAP) points, respectively. 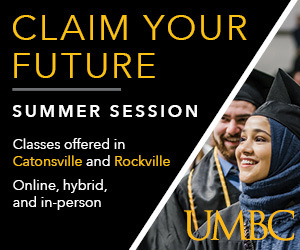 At the end of last fall semester and the beginning of this spring semester, students hung door hangers on community members’ doors to spread the word about The Big Event and invited them to request students to assist with any tasks they needed completed, The Big Event’s marketing co-chair Anna Gibney said.